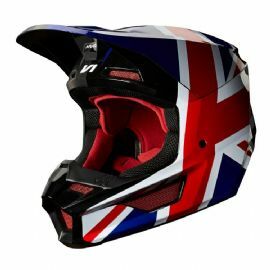 Regl Special Edition takes us to UK with MXoN-inspired helmet. Available in Union Jack national flag colors. The helmet features our exclusive Magnetic Visor Release System (MVRS) to manage rotational forces. This patent- pending feature removes the three visor screws and replaces them with magnets to allow the visor to release from the helmet in the event of a crash, while also securely staying in place when needed.